December 05, 2013, 5:35 p.m. Most Americans think that 75 year-olds should have to re-sit their driving tests in order to keep on driving, while people also it&apos;s about as difficult as it should be to get a license in the first place. In Illinois, people over the age of 75 have to re-sit their driving test whenever they renew their license, making the state the only one in the country to require this of the elderly. That said, many states require elderly drivers to pass vision tests or take remedial courses if complaints are made about their safety as drivers. Most states shy away from taking steps that would limit the independence of senior citizens, but they also grapple with the reality that over-80s are as likely or even more likely than teenagers to be involved in fatal accidents. 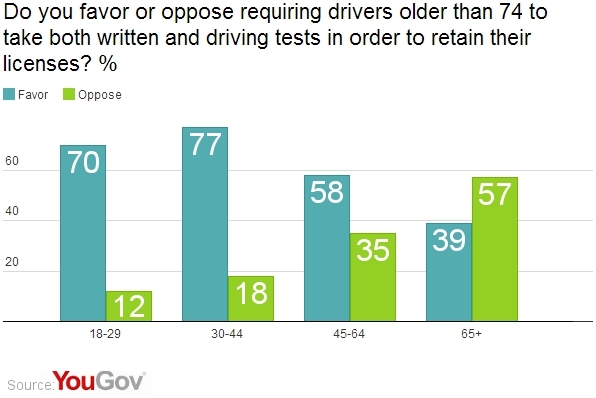 The latest research from YouGov shows that most Americans (62%) support requiring older drivers to re-sit their tests, though 30% disagree and think that the elderly should be able to keep their licenses without resits. Predictably, the older you get, the less likely you are to support mandatory test re-sits for the elderly. 57% of over-65s oppose mandatory tests. Support for mandatory testing of over-75s is highest among people aged 18-29 (70%) and 30-44 (77%). Most people also think that driving tests are about as difficult as they should be. 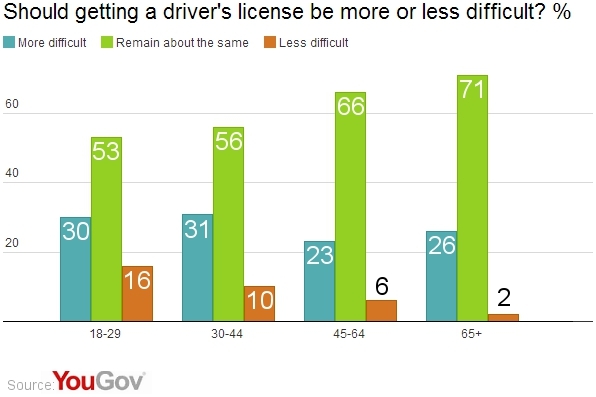 Interestingly, younger Americans are both more likely to think that it should both be more difficult or less difficult to get a driver&apos;s license. People aged over 65 are the most likely to support the current system, with 71% saying that current tests are about right. 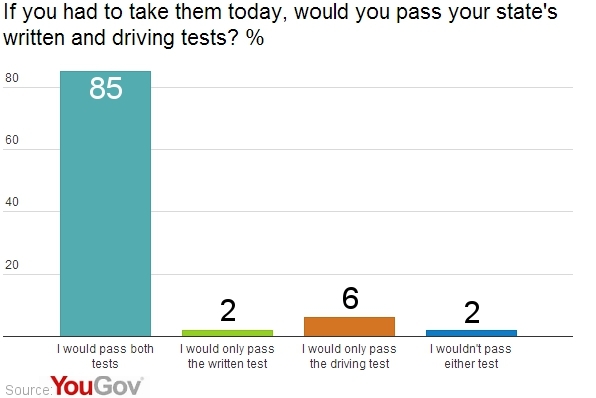 Americans are overwhelmingly confident that they could pass a driving test in their state if they were suddenly required to take one today. Only 10% of people think that they would fail, and only 2% think that they would fail both the written and driving tests. Interestingly, despite it being a well-known fact that women are less likely to be involved in collisions than men, only 78% of women say that they would pass both tests. Men, on the other hand, are much more confident of their driving abilities, with 93% saying that they&apos;d pass a test if they took it today.